The introduction of new vaccines in the EPI programmes has led to an exponential increase of both the value and volume of vaccines. The new vaccines are relatively expensive, require more cold storage capacity and most of them are both heat and freeze sensitive and should be stored between +2°C and + 8°C. These factors intensify the demands on the Immunization Supply Chain as they impact many areas; e.g. increased number of journeys to pick up from the airport, increased required cold truck capacity, increased cold chain capacity requirement at all levels, increased need to manage the vaccine supply chain and increased risk as the value of vaccines in storage increases. This creates huge challenges for the EPI programmes and the need for strong logistics systems. The graph below from the EVM latest report shows the planned increases between 2015 and 2020 alone. 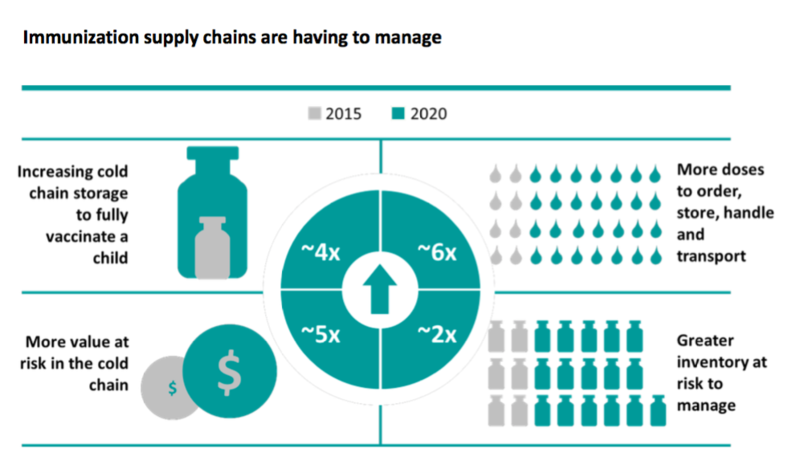 Even though the value of vaccines has increased exponentially, investments in the cold chain have been lagging behind, exposing vaccines to greater risks. If vaccines are not stored at the right storage temperature of (2-8°C), this can result in damaged vaccines, unprotected children and wasted country/donor investment. Many exposures happen in static storage; this is why monitoring and managing CCE temperature is critical. Accurate temperature monitoring data can act as a proxy of the cold chain status and pinpoint equipment issues that need to be addressed. Obsolete and malfunctioning equipment, included in cold chain capacity estimates can create a gap between estimated cold chain capacity and effective cold chain capacity. This dichotomy can endanger the vaccines and it is therefore critical for EPI programmes to get actionable data on the actual status of the cold chain and know the real capacity. A root cause analysis can help identify the main bottlenecks and challenges of the current system as per the example of the figure below. Being aware of the traps is a first step towards being able to avoid them. WHO Immunization in practice provides an overview of the recommended practices and clear instructions for temperature surveillance for vaccine handling as well as a list of recommended corrective actions to be taken by health workers when the refrigerator’s temperatures are out of the recommended range below +2°C or above +8°C. 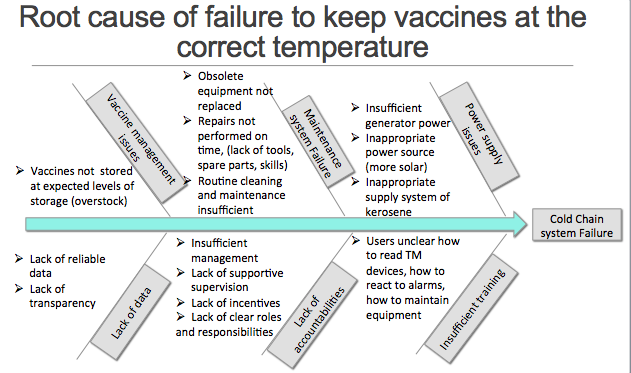 Temperature monitoring studies (see related resources) provide an evaluation of the cold chain and show that the main causes for equipment failures leading to temperature excursions can vary significantly from one country to another and range from power outage, thermostat improperly adjusted, failed compressors in aging refrigerators to flat batteries due to dirty panels for solar and more. Conducting a Temperature study can help pinpoint what segments of the cold chain represent the major challenges and risks and can help countries set their priorities when improving their temperature monitoring. The risks inherent to the possible solutions for temperature monitoring must be assessed as well: e.g. for 30DTR, the risk of the batteries expiring before new supplies of devices are available, the risk of the data not being used apart from the daily reading by health workers, for RTM, the risk of using temporary SIM cards that run out of cash, the risk of not being able to manage the data. Countries embarking on a project of implementing systematic temperature monitoring need a good understanding of where the focus needs to be and where the risk is highest. To minimize these risks a system is needed that can systematically detect, escalate and address issues with CCE.